Biogents’ passive BG-GAT (Gravid Aedes Trap) attracts female Aedes (Stegomyia) mosquitoes with water and oviposition cues. These mosquito species are vectors of diseases like dengue fever, Zika, chikungunya, or yellow fever. 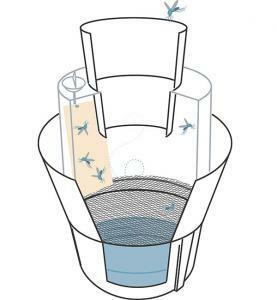 Mosquitoes trying to find an oviposition site enter the transparent chamber through the black funnel on top of the trap. In the transparent chamber they are exposed to a sticky surface, oil, or insecticides. 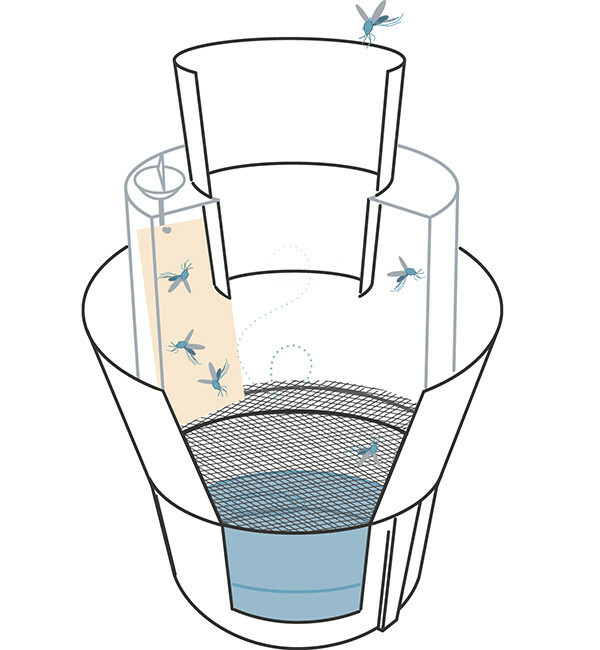 The transparent chamber makes it difficult for the mosquitoes to escape, and the black mesh net provides a barrier between mosquitoes and the infused water. Dead mosquitoes can be collected. The BG-GAT trap was developed by Dr. Á. E. Eiras from the Universidade Federal de Minas Gerais, Belo Horizonte, Brazil and by Dr. S. A. Ritchie from the James Cook University, Cairns, Queensland, Australia. Biogents produces and distributes the trap under an exclusive license agreement with both universities. Sticky cards can be purchased separately from Biogents, please contact sales@biogents.com. 2) A thin film of oil can be wiped on the inside of the translucent chamber. The oil “wets“ the wings of the mosquitoes, and makes flight impossible. 3) Alternatively, you can use residual surface spray insecticides that will kill mosquitoes through contact (e.g., Mortein Outdoor Barrier Surface Spray, imiprothrin 0.3 g/kg, and 0.6 g/kg deltamethrin Reckitt Benckiser Pty. Ltd.). Do not spray the black bucket or entry funnel. This will repel mosquitoes! Retreat the translucent chamber monthly. The smell of the new plastic of the traps might initially have repellent effects on the mosquitoes. Therefore, we recommend to store the traps with some water outside, or two weeks before using them in the field to get rid of the smell. The black colour of the BG-GAT attracts mosquitoes from some distance. So, the trap needs to be placed where it is readily visible, but protected from rain. Please do not hide the BG-GAT in the bushes! Johnson et al. (2016) Field comparisons of the Gravid Aedes Trap (GAT) and BG-Sentinel trap for monitoring Aedes albopictus populations and notes on indoor GAT collections in Vietnam. Journal of Medical Entomology, Oct 5. pii: tjw166. Heringer et al. (2016) Evaluation of Alternative Killing Agents for Aedes aegypti in the Gravid Aedes Trap (GAT). Journal of Meduical Entomology 53(4):873-879. Brian Johnson and Scott Ritchie (James Cook University, Cairns, Australia) describe field trials of the BG-GAT trap, Singapore sticky and CDC AGO traps in 2014 – 2015. Brian Johnson and Scott Ritchie (James Cook University, Cairns, Australia) put a 484 Hz sound generator into a BG-GAT trap and thus turned it into a trap that captures male Aedes aegypti. Problems and Solution suggestions, reported by Scott Ritchie. Based on this latest report of Scott Ritchie we recommend to store the traps outside for two weeks before using them in the field to get rid of the repellent smell of the new plastic. We will further develop a net that can be easier attached with elastic instead of the mounting ring. New nets will come in the beginning of 2015 and will be sent to our customers. In the meantime a triangle cut in the top of the transparent chamber will help you to easier fix the mounting ring over the net and chamber. The insecticide nets can just be placed inside the transparent chamber instead of straining them over the chamber. This seems also to be a good alternative. S.A. Ritchie, T.S. Buhagiar, M. Townsend, A. Hoffmann, A.F. van den Hurk, J. McMahon & A.E. Eiras (2014) Field Validation of the Gravid Aedes Trap (GAT) for Collection of Aedes aegypti (Diptera: Culicidae). Journal of Medical Entomology 51(1): 210-219. The BG-GATs are available in multiples of twelve with a tiered price structure depending on quantities ordered. A price list can be found in the product catalog. 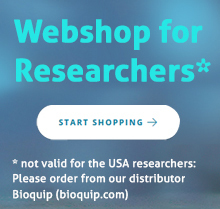 The BG-GAT can be purchased by contacting our customer support by e-mail sales@biogents.com or by fax (+49 941 5699 2168).